Welcome to Scandinavian Baking! 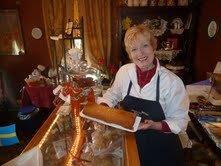 We are a small bakery located in Chocorua Village, a Village of Tamworth, NH. From old family recipes, I am proud to offer you the best of Scandinavian Baking! I hope you and your family will enjoy by my breads and baked goods prepared “with love and butter”. Hejsan, My wife and i had stopped in several months ago and bought some cookies. I was the one who is Swedish and moved up here last year from Atlanta. I’m not sure if you remember me. Anyway, my wife is planing a Lucia/Christmas event at the Denmark Arts Center on Friday, December 18 at 7:30pm. First of all, we would like to invite you to the event. Second, we would like to know if you know of any singers who might like to participate in the show and if you know anyone who might know the Lucia song. Also, we would like to order some Bullar and cookies for the event. Please let us know. You can email us at culinden@gmail.com or call us at 207 452 2118. Thank you.